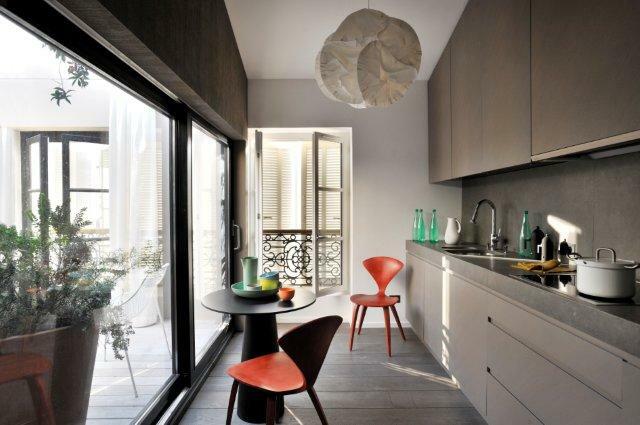 In the heart of Marseille, in the La Joliette district, Francois Champsaur has completed his renovation and redevelopment of a 150m2 apartment. 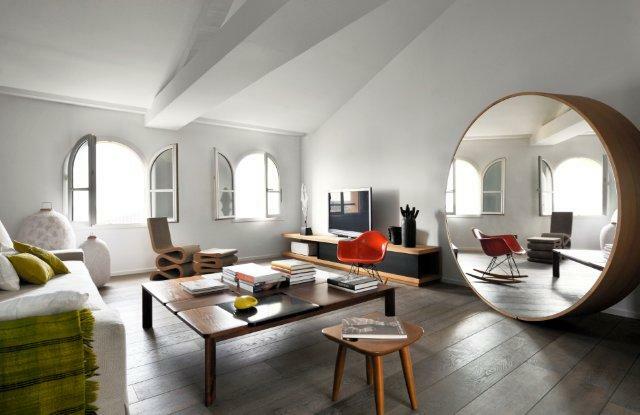 Situated on the top floor of a recently renovated building by Adrien Champsaur Architecture, the apartment overlooks the MuCEM, a new museum of civilisations from Europe and the Mediterranean, designed by Rudy Riciotti, and which is due to open in 2013.The apartment comprises of a sitting room, two bedrooms with en-suite bathrooms, a dining room, a kitchen and a patio. The sitting room offers the widest space, since it has been cleared of all fixtures and fittings (no cupboards or storage space) and enjoys a high ceiling. To counter balance this height, the whole of the space is occupied with a few pieces of fairly low furniture, but all in a XXL version. In a non-conventional manner, the bookcase has been placed in the corridor, on the highest wall of the apartment. As such, it structures the central space and acts at the same time as a corridor and walkway.The renovation of the attic allowed for the creation of a roof terrace, or patio, which opens entirely out over the apartment, constituting an ‘exterior room’ and covered in wood in its interior section. With real wells of light, the patio consequently offers clarity and outlooks from every view-point. The whole complex is very open and light, and is unified by the use of the same flooring (for every surface, including the patio), which is regulated by the lay-out or walk-ways covered in black tinted oak, creating a graphic effect, and outlined by the alternating black and white, and horizontal/vertical axes. Wiggle side chair, designed by Frank Gehry (1972), in corrugated cardboard. Vitra edition.Wiggle stool, designed by Frank Gehry, in corrugated cardboard, gusset in white lacquered hardboard. 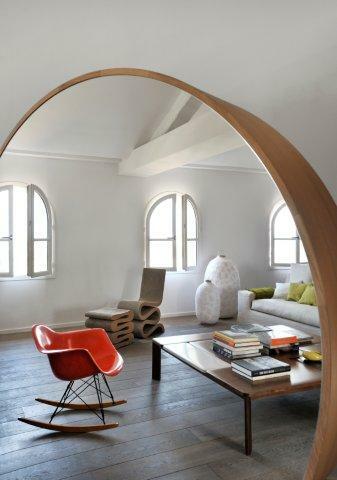 Vitra edition.‘ROUE DE CLEMENT’ mirror-light fixture, designed by Pascal Michalou. Outer ring in clear oak.‘SONIA’ stool, designed by Sergio Rodriguez (1997), Classicon edition. Handmade solid eucalyptus wood.Oak parquet flooring, ‘gris flamant’ shade.‘BLUFF’ coffee table, designed by India Mahdavi. Walnut finish, white and black lacquer.‘BEL AIR’ upholstered sofa, designed by Francois Champsaur.‘COCOON’ lamp, designed by Paola Navone.Low cabinet, designed by Francois Champsaur, in natural oak with 2 sliding doors in black lacquered metal. ‘CLOUD’ suspension light by Frank Gehry, Belux edition.‘DIGAMMA’ armchair, designed by Ignazio Gardella, Santa and Cole edition. Adjustable upholstered armchair in black velvet.‘PEPPER’ coffee table, designed by Francois Champsaur, Pouenat edition. Stained brushed oak base and lacquered aluminium table top in matte blue.Oak parquet flooring, ‘gris flamant’ shade. ‘HEAVEN’ Garden chair, designed by Jean-Marie Massaud, Emu edition.‘PEPPER’ outdoor table, designed by Francois Champsaur, Pouenat edition. 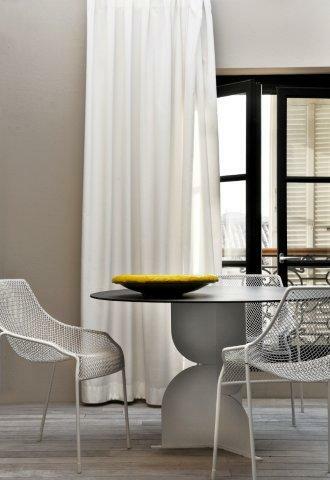 Lacquered aluminium table top in matte brown and lacquered aluminium base in matte white. Linen embroidery, in Cross colour 03 natural.‘RAR’ rocking chair by Charles and Ray Eames, in poppy red. 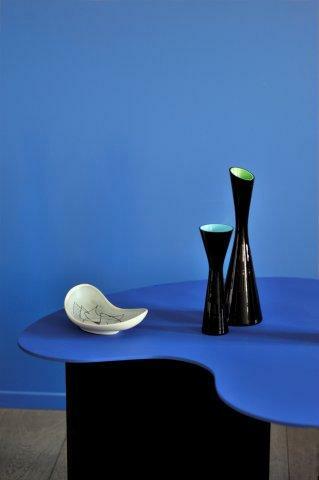 Vitra edition.‘BLUFF’ coffee table, designed by India Mahdavi. Walnut finish, white and black lacquer.Wiggle side chair, designed by Frank Gehry (1972), in corrugated cardboard. Vitra edition.Wiggle stool, designed by Frank Gehry, in corrugated cardboard, gusset in white lacquered hardboard. Vitra edition. 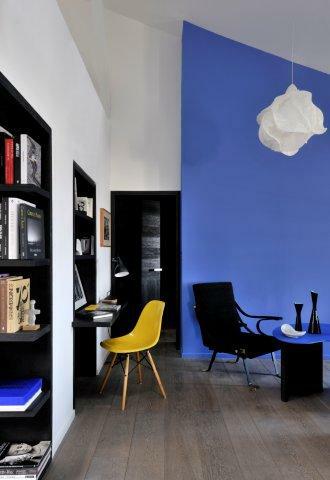 ‘CLOUD’ suspension light by Franck Gehry (2005), Belux edition.‘CHERNER’ chair, designed by Norman Cherner (1958), in Stella Orange.Oak parquet flooring, ‘gris flamant’ shade.‘RAVEL’ terracotta pot. Cascais stone kitchen worktop.‘CONTAINER’ table, designed by Marcel Wanders, Moooi edition. 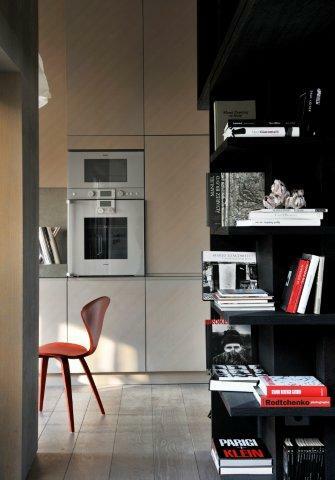 Black stained oak veneer bookcase, matte varnish.‘CHERNER’ chair, designed by Norman Cherner (1958), in Stella Orange.Oak parquet flooring, ‘gris flamant’ shade.Kitchen unit designed by Francois Champsaur, in stained oak veneer, matte varnish.Linen head board. ‘TMH’ standard lamp, designed by Miguel Mila (1961), Santa and Cole edition.‘SONIA’ stool, designed by Sergio Rodriguez (1997), Classicon edition.3 panel curtains in ticking fabric. Bench designed by Francois Champsaur. Base in oak and solid oak veneer. Sanded and black stained finish. 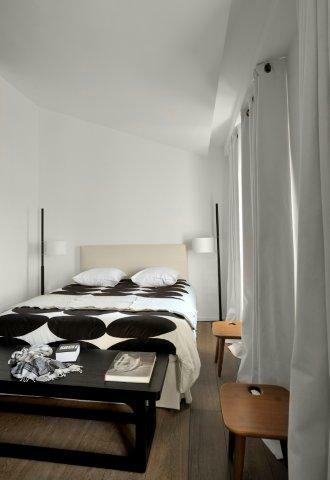 Posted on September 10, 2012 September 10, 2012 by AparnaPosted in Decor, Design, Interior Design, LifestyleTagged decor, design, France, Francois Champsaurs, Frank Gehry, Home, Interiors, Jean-Marie Massaud, La Joliette, Lifestyle, Marcel Wanders. What a fabulous home. Truly inspirational for a MCM girl like me!